Based on intergovernmental agreements on science and technology cooperation, JST have been executing the international joint research program called SICORP since FY2009, together with leading countries and regions and in research fields that have been strategically prioritized by MEXT. The aim of this program is to contribute solutions to challenges facing world today and to bolster Japan's scientific and technological capabilities through collaboration with a broad range of countries. JST liaises with funding agencies in counterpart countries and regions, and on an equal partnership basis selects research projects supported by both countries. JST provides large-scale funding to Japanese researchers though SICORP and counterpart researchers are to obtain project funding approximately equivalent to SICORP from funding agencies in their respective countries. Financial support includes costs for (1) goods, (2) personnel, (3) dispatch and invitation of researchers, (4) workshops, and other costs necessary to execute projects. 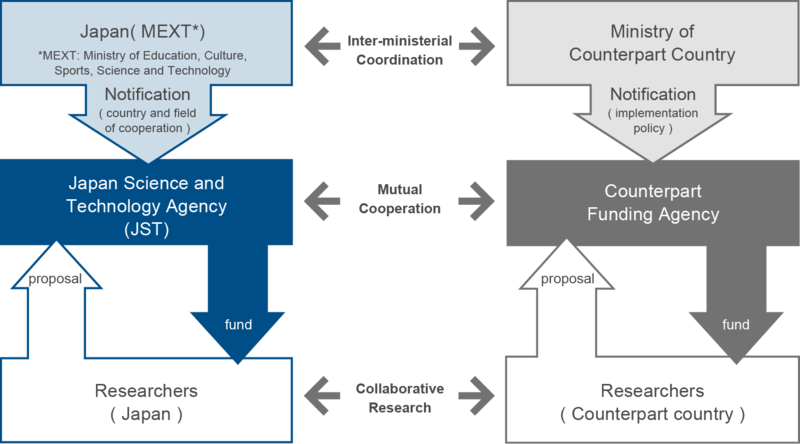 Under the guidance of Program Director (PD) and Program Officer (PO), JST implements joint call and joint review of international joint research projects in coordination with the counterpart funding agency (FA). Counterpart research groups will be funded by FA of their own country at equivalent level as JST does for research groups of Japan side. Active international collaboration is key to the excellence of mutual scientific and technological endeavors. Aiming at further development of science and technology, JST is enhancing active international research collaborations through solid partnerships with counterpart countries. SICORP is the equal partnership program which provides research funding to projects selected through an open joint call and joint selection procedure. JSTʼs operation of SICORP is implemented under the supervision of a Program Director (PD) and Program Officer (PO). This program supports international collaborative research focusing in the Asia region, aiming to strengthen science and technology development while facilitating research networks by working towards solutions to common regional problems. 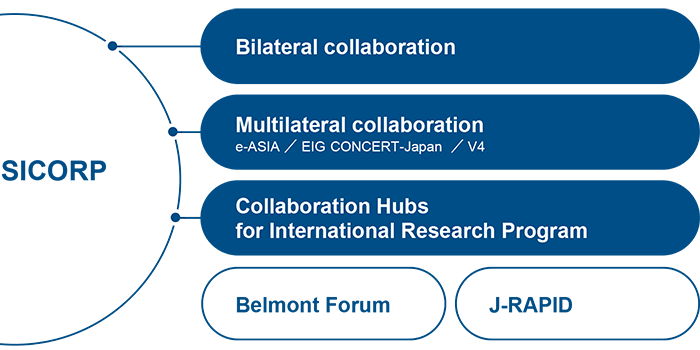 CONCERT-Japan began as a project platform for international cooperation activities under the EU's Seventh Framework Programme for Research and Technological Development (FP7). After ending in December 2014, it continued under its successor EIG CONCERT-Japan, with 9 European countries and 10 funding agencies as of 2017 partnering with Japan to further collaborative research. Through the exchange of S&T policy information, research exchange, network building and joint calls, the program supports the funding of projects in a variety of fields. This program supports long-term (up to 10 years) cross-funding of science and technology Japan's identifiable support. Bringing about outcomes and achievements of future international research exchange. Through the creation of international joint research hubs in important S&T diplomacy countries and regions for, Japan in order to solve global and common-regional problems through the expanding networks, personnel exchange, innovation and implementation for future societies. J-RAPID acts as a bridge to primary research investigation through the flexible support of urgently required actions for data collection and problem-solving in the wake of disasters and unexpected events. It's features include: 1) Rapid program deployment enabling the commencement of early research investigation; 2) Program adminstration through cooperation with disaster-affected national government organisations; 3) Research investigation by a collaborative team including local as well as international researchers. The result is not only contribution to academia but also direct influence on restoration of the affected region, with the additional goal to advance disaster resilience in many other countries including Japan.